Images on Cover 4 and Cover 5 are product photos from the fabulous Etsy shop The Twisted Screw. Used with permission. I sourced some different artwork because I wasn’t happy with the stock photos in the previous lot of covers. See, I mentioned ‘useless perfectionist dithering’ didn’t I? 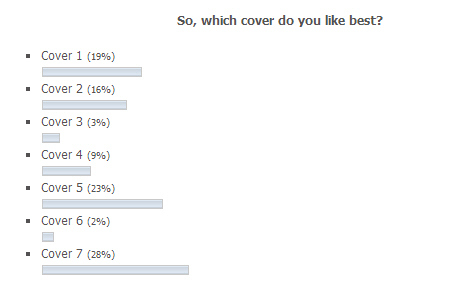 So I’m asking for your opinion on which you like best AGAIN (I included the two top-rated covers from the previous poll, so if you still like those best, you can hit that vote button again and mutter “FFS, I already DID this!!”). Book cover – have your say! I’m wanting to get my book out in the next few weeks (I know… exciting!! *squee*). I’m prone to a kind of useless perfectionist dithering, which is not doing me any favours because I will forever be going ‘No not happy, I need to change *something else* now…’ ad infinitum. I’m kind of stuck and could use some creative help. Like every other blogger in the entire world who fancies themselves a writerly type (i.e. all of us! ), I’m putting together a book. It’s an erotica anthology comprised of true-life vignettes about female dominant/male submissive play: passion, violence, sweetness, affection, love. If you’re familiar with the way I write, you will know exactly the sort of thing I mean (if not, here’s an example: Good morning).